Suffering from one or more swollen lesions on your face, trunk or buttocks? You may be having a condition called Acne Conglobata. Read on to know what is Acne Conglobata, what causes it, its symptoms, diagnosis and treatment. 3 Where Does Acne Conglobata Appear? 5 Is Acne Conglobata Genetic? 11 Is Acne Conglobata Painful? 12 Can You Die From Acne Conglobata? Acne Conglobata is a highly severe type of cystic acne. It is an inflammatory disease characterized by the appearance of scars and abscesses over the skin surface. This is a rare disorder that is found more in males than females. It is generally found in young adults between 18 and 30 years of age. But Acne Conglobatacan can also be seen in infants. ‘Acne Conglobata’ is pronounced as ‘Ak-nee-kon-glow-bah-tah”. Acne Conglobata look like swollen nodules on the skin surface. These usually arise in groups of two or three. These inflamed nodules are over 5mm in diameter. Where Does Acne Conglobata Appear? The common Acne Conglobata locations are neck, face, upper arms, chest and buttocks. These are large, swollen and have a black head. These have a scab in the middle and continue to spread toward the outside. In the later stages, the lesions become filled with foul-smelling pus and drain from time to time. The main cause of this condition is not known though medical researchers have identified some factors as triggers. Harmful gases like halogens or dioxins and anabolic steroids are found to bring on severe acne in individuals. Stopping a testosterone course can also cause this condition. Testosterone imbalance is held to be a main reason for this disorder which is a reason why men are seen to suffer more from Acne Conglobata than women. These lesions are also seen to appear in people who are recovering from autoimmune diseases like Leukemia or have tumors releasing high amount of androgen. As aforesaid, the exact causative factor for Acne Conglobata is unknown. However, many medical researchers suspect genetics to have a strong role behind the appearance of lesions of this type. This is because patients with Acne Conglobata are often seen to have one or more family members suffering from these cysts. Acne Conglobata is marked mainly by the appearance of lesions on the skin. The bumps generally arise on the skin surface of the face, neck, trunk and buttocks. These consist of a blackhead and are large in shape. In later stages, these are filled with fluid and may be tender to touch. The vesicles last for a while and continue to swell until they burst releasing pus. Once a lesion drains, it fills up again. In most cases, several nodules can rupture only to come together to form a larger cyst. The lesions last for a long time. Even after they heal, they can leave behind a car or small bump on the skin surface. But following treatment, they can go away in a few weeks. Initial treatment of Acne Conglobata involves use of topical creams and antibiotics. It is often found to be resistant to therapies. Isotretinoin, a Vitamin A derivative, is used as the main Acne Conglobata cure. It is prescribed to patients who suffer from severe nodules on the skin and fail to respond to any Acne Conglobata medicine. This is an oral medicine prescribed as a course for 15-20 weeks. In most sufferers, a single course of Acne Conglobata has been found to clear away acnes. Accutane is very effective as an Acne Conglobata medication. It helps in reducing the amount of sebum, it has been found to give rise to many side effects like dryness of skin, lips, nose and mouth. There is also mild muscular or joint pain. In severe cases of acne conglobata laser treatment can be used. Co2 laser ablation is used for abrasion of the cysts. It is followed by fractional laser. Natural Acne Conglobata home treatments consist of natural topical medicines and dietary modifications. The application of Tea Tree Oil over acne has been found to give satisfactory results. Acne problems are found to affect those people who eat more processed food and more sugary, salty or spicy foods. Stay away from chips, very salty dishes, refined flour and chemicals. Incorporating more herbs into your diet can be an effective natural remedy for you. Mix oatmeal into water and make a thick paste. Apply this onto your face twice a day, for 10-20 minutes during each session. The paste should ideally be applied once in the morning and once at night before going to sleep. Add some baking soda into a glass of water and make a thick paste. Apply this one your face for one or two times a week. Leave the face pack undisturbed for at least 15-20 minutes. If your skin feels too dry after the wash, use some Aloe Vera. Use a gentle nourishing Goat’s Milk soap to clear your skin surface. Use Aloe Vera to make your skin a bit moist if it becomes very dry. Acne Conglobata cysts are generally painful. These lesions erupt as painful vesicles on the skin surface oozing pus at irregular intervals. Can You Die From Acne Conglobata? 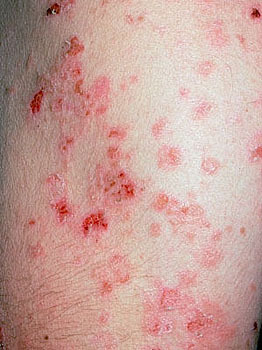 Acne Conglobata is a benign condition. It does not cause death though it disfigures a person inviting social ostracism. This leads to anxiety and depression in sufferers. Want to check if the lesions on your skin are really Acne Conglobata? Here are some pictures of Acne Conglobata that you will find useful. Check out these Acne Conglobata photos. 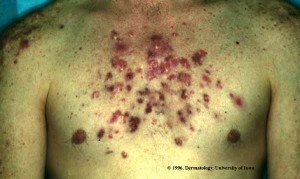 Compare your lesions with those in these Acne Conglobata images. If you suspect yourself or any of your family members to have Acne Conglobata cysts, you can use some home remedies and watch the condition of the lesions for some days. If the cysts do not show an improvement even after a week, you can seek medical assistance. Timely medical treatment will help you get rid of the condition faster and with minimum discomforts and irritation. Nice article, btw… what with the prevention? Keeping my family from acne conglobata cysts.